Because I like GUST With Cavia dead (RIP you beasts who made Neir) GUST is by far my favourite developer. So chat about GUST here. Got a favourite game? What are you looking forward from them that's coming up? No love for GUST here I see. Too bad, too bad. TOTORI FTW! There ya go, that's better. Astor M wrote: No love for GUST here I see. Too bad, too bad. Played any of GUST's other games? Gotta admit - the closest I've come to touching a GUST game is Cross Edge, purely on the basis that it has Ar tonelico characters in it (it wasn't developed by GUST to my knowledge). And despite liking a fair few JRPGs...I was not a fan, to say the least. I've been meaning to try one of the Atelier games since they look markedly different but I have no clue where to start. Been leaning on the upcoming Meruru game since it comes out in like a month and I like my games portable but any better suggestions (particularly if continuity is relevant)? Midori wrote: Gotta admit - the closest I've come to touching a GUST game is Cross Edge, purely on the basis that it has Ar tonelico characters in it (it wasn't developed by GUST to my knowledge). And despite liking a fair few JRPGs...I was not a fan, to say the least. Totori is a better place to start with the portable Atelier games. Meruru doesn't require back knowledge, but it does help, as there are returning characters. If you do get one of the PS3 games, I also recommend Ayesha. It's the start of a completely new trilogy, and it's a little more accessible - the Atelier Arland games (Rorona, Totori, Meruru) can be a little confusing the first time if you haven't played one of them before. Ayesha is far friendlier for the complete newbie. That said my entry point to the series was Rorona, the least accessible of the PS3 games, and we all know how that turned out in terms of getting me interested in the series (and GUST in general). Regarding Ar tonelico - I have't played Cross Edge, and the only Ar tonelico game I've played is the third, and it does take more work to enjoy. If you think of the Atelier games as "gateway drugs" into real otaku JRPGs (because they're only just slightly more otaku than a typical Final Fantasy or Dragon's Quest game), Ar tonelico is GUST's attempt to prove to the Akihabara audience that it can be as peverse as Compile Heart and 5pb. It's a game where the female characters become more powerful as they strip clothes off. Needless to say, I was a Gust fan. Now I am not. Eh, you're in the minority there. Since the PS3 and then acquisition by Tecmo Koei, GUST has barely put a foot wrong, and its games are, objectively, far better now than they were back in the PS2 days. The fact that GUST's fan base has increased exponentially this generation is a pretty good indication they have got things right. The fact that it's different to other JRPGs? That's a good thing. Leave the generic stuff to the Final Fantasy games and Tales games. People like Atelier games because they're different. I Just found the characters in the PS3 games absolutely insufferable after only a few hours. I seriously couldn't stand any of them. The story was meandering and just couldn't get myself to care about what was happening - not unusual when I don't like the characters, but I felt there was something extra to the writing there that just left me frothing by the time I finally gave up on it. I can't quite put my finger on it, though. I've blocked out too much of those games. I don't usually mind a bad story. There are remarkably few RPG stories I find are actually good. It's really the characters I had a big problem with. If I don't like even one of them, it actively impedes the game for me. Well OK, your objection to the games are noted. As this is the GUST *fan* thread though, we shall save that discussion for a future topic. "lost cause"? I don't know what to think about myself, Ar Tonelico is the only series I've played from GUST and I loved it. Haha, it is a weird series though, and it only got weirder with each game. I'm playing Totori right now, i'm like 10 or so hours in and it's so different from Ar Tonelico. I'm totally getting the rest. Talking about Ayesha, you said is a new series? So the Escha & Logy game is part of this new series? I'm sure you heard of Chrono Materia for the Vita. I saw some screen shoots and the art style looks similar to the Atelier games. Tecmo Koei have been supporting the Vita like nobody else. I never played any of the Orishi games but I'm looking forward to the Vita port. It is impressive to see TK so strongly support the Vita - and I'm glad that games like Toukiden are selling well to justify the investment. I have Ciel no Surge on the Vita (GUST's first Vita game) and it's a load of fun. Of course I haven't heard of Ciel no Surge because it hasn't been released here! But i might just import it after Totori and I need Toukiden too. After all I am mostly free this winter because I'm not getting any other game after KH:HD Collection. No PS4 or GTA5. JRPG's is all I need! Astor M wrote: Of course I haven't heard of Ciel no Surge because it hasn't been released here! But i might just import it after Totori and I need Toukiden too. After all I am mostly free this winter because I'm not getting any other game after KH:HD Collection. No PS4 or GTA5. JRPG's is all I need! Ciel no Surge isn't a JRPG, though it takes place in the Ar Tonelico universe. It's a 'life sim' - a genre near exclusive to Japan where the entire point of it is simply to interact with a pretty anime girl. But, yeah, I'm in the same boat as you. Aside from some strategy games - like Warhammer and Total War, and Bioware, and CD Projekt Red, I have next to no interest in anything developed outside of Japan. Mostly because I don't have time for much else, there's so much great stuff coming out of Japan at the moment. Hey, Atelier Meruru Plus is supposed to release today for the Vita, but I just saw that Atelier Rorona Plus will be released in November too. I know that Atelier Rorona comes before Totori, so I was wondering if I should wait for Rorona and then get Meruru? I already played Totori. Btw, is Piana the new protagonist in Atelier Meruru? Or is Meruru a new character? I also saw that Sterk will be playable in the new Warriors Orohi 2. I would have preferred Mimi but I guess Sterk is ok. But is cool that Atelier is getting a little more recognized. I just finished Totori and I don't just like it, for some reason I am addicted to it. I love it so much. The time system and the synthesizing stuff are just amazing, and the characters, ohh the characters. The character design by Mel Kishida has to be one of my favorites in JRPG's, the design is just beautiful. Astor M wrote: Hey, Atelier Meruru Plus is supposed to release today for the Vita, but I just saw that Atelier Rorona Plus will be released in November too. I know that Atelier Rorona comes before Totori, so I was wondering if I should wait for Rorona and then get Meruru? I already played Totori. 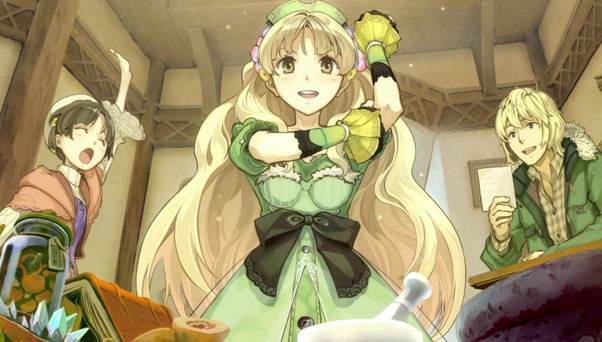 Btw, is Piana the new protagonist in Atelier Meruru? Or is Meruru a new character? if you've played Totori you can move on to Meruru no problem - I absolutely recommend it - it's my favourite Atelier game by some margin. Meruru is the heroine of the game, not Piana. Sterk is a good add for Warriors Orochi. I would have liked at least one of the Ateliers as well though - Rorona likely. They are the focus of the game after all. Hey Matt. I've been thinking on getting Atelier Ayesha but a friend of mine that played the rest of the Atelier games told me that Ayesha was really bad and that I should skip on it. What do you think about it? I want to get it because Escha and Logy is coming next year and I want to see the story. I haven't played Rorona yet, but I want to wait and see if we get the Vita version localized, I'm sure it will come. Astor M wrote: Hey Matt. I've been thinking on getting Atelier Ayesha but a friend of mine that played the rest of the Atelier games told me that Ayesha was really bad and that I should skip on it. What do you think about it? I want to get it because Escha and Logy is coming next year and I want to see the story. I take it this friend isn't a fan of the Atelier franchise, or for whatever reason got upset by the lack of a Japanese voice track? I enjoyed Ayesha. Not as much as Meruru (but then that comment also applies to every game every made except for Nier). But Ayesha is good fun. It's a little more streamlined in the alchemy compared to the other games, which some people interpreted to be a "dumbing down" of the game (not really), but the game itself looks gorgeous and has a far more mature and intelligent narrative than the Arland series. Yeah, he did mentioned the lack Japanese voices but that's why I asked you, I don't think that alone would make the game bad. I do prefer the Japanese voices when available but I don't care much. I'll get it anyway. I have a good list for this Friday including Hyperdimension Neptunia Victory, Ni No Kuni and Time and Eternity. Astor M wrote: Yeah, he did mentioned the lack Japanese voices but that's why I asked you, I don't think that alone would make the game bad. I do prefer the Japanese voices when available but I don't care much. Some people seem to get very upset by the lack of voice tracks, but like you it doesn't affect me too much personally. I just started working on Hyper Victory as well. Liking it so far. I recently finished Ar Tonelico on the PS3 and I just can't get that game out of my head. I loved the characters and the Japanese voice acting was awesome. I really liked the part where you dive into the female characters mind and is like a mini Visual Novel. The best one was Tyria and the multiple endings, it was so good! I'm sad because is the last game on the series. Now they are doing Ar No Surge and is like a spiritual successor or something. It looks like a combination of Ar Tonelico and Atelier and that is like like, I don't even have words to describe how awesome that sounds. I recently got into the Atelier series but I did play the first Ar Tonelico games and Mana Khemia (I recently found out they where made by Gust too). So, Ar no surge is on my list of most anticipated games right now. Anyone else looking forward to it? Astor M wrote: I recently finished Ar Tonelico on the PS3 and I just can't get that game out of my head. I loved the characters and the Japanese voice acting was awesome. I really liked the part where you dive into the female characters mind and is like a mini Visual Novel. The best one was Tyria and the multiple endings, it was so good! I'm a big fan of Ar Tonelico as well - the characters really appealed to me as well. Not as special as the Atelier games, but very playable. As for Ar no Surge - sadly I haven't heard any news of it being localised (and it might be a bit TOO out there for Tecmo Koei), but fingers crossed still. And, of course, you can nab it from Japan thanks to a region-free Vita. I think there's a chance. Gust has been getting some more recognition lately. They have an anime coming plus Atelier Escha and Lodgy is being localized and they even localized the Vita Atelier's, except for Rorona but i'm sure is coming. Ar No Surege is kind of their new IP too, it would make sense for them to localize it and get some fans for it. There's also Ciel No Surge, I want to import that one too, but i'm going to Japan in a few months so i'll just grab it then I guess. So, I've been told in detail that Atelier Ayesha fixes most of the major issues I had with previous entries in the series. I'll have to keep an eye out to see if I can grab that game, then. BTW, I found out that apprently, according to Wikipedia, Atelier Iris: Eternal Mana and Atelier Iris 2: Azoth of Destiny were released in Australia. I suggest a certain somebody keep an eye out for them. EDIT: I checked eBay Australia, too. Their prices aren't that bad considering how rare they are.